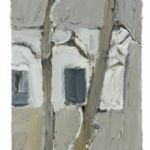 North House Gallery is delighted to present three dozen or so works by Ffiona Lewis, her first major show since her sellout exhibition at the Redfern Gallery in 2015. 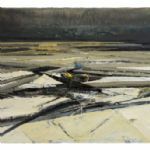 There is a new exuberance in her drawing and painting, reflecting her delight in a new studio, printing press and everyday surroundings on the upper reaches of the River Deben in Suffolk. 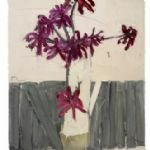 The structural marks in graphite and paint are bolder and more gestural, but there remains an interest, especially in the paintings, in the spaces between the structure: looking through the trees to the buildings beyond, or simply to the sky; looking through the stems and petals of flowers or the wickerwork of a basket. 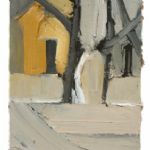 As well as the paintings and drawings of flowers, trees and farm buildings, there are new, black, seemingly abstract monotypes, inspired by the pamment paths through the garden. 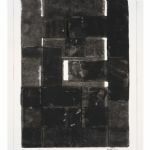 Again, the subtlety is in the white gaps between the printed rectangles. 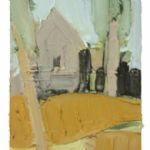 Her palette, still consciously limited, has altered with the change in location: less the blues of her earlier subjects in maritime Suffolk and Cornwall; more the earthy colours of agricultural Suffolk. 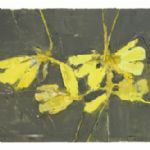 Ochre and Davy’s Gray are important enough to warrant mention in several titles: Russet and Bramley, Ochre; Old Bramley, Davy’s Gray; Farmhouse through Beech, Ochre on Davy’s Gray. 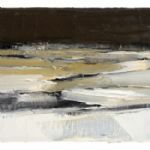 Even her Winter Sea paintings are largely ochre, grey and black, although there are hints of blue underpainting emerging in the larger works. 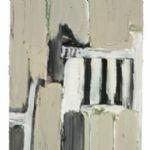 Most of the paintings are still on board or gesso board: firm surfaces which allow the artist to repeatedly add and remove paint with a palette knife or scraper. 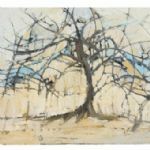 However, there is a greater use of brushwork than before, which is leading to an interest in canvas, rather than board, as a substrate. 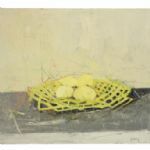 Ffiona Lewis, born in Devon in 1964, trained as an architect, qualifying in 1990, but maintained an interest in fine art throughout her studies. A growing dissatisfaction with her career choice led her to a series of courses at Central St Martins before becoming a full time artist. 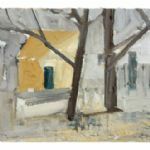 She has had 28 solo shows since 1993, most regularly at the Redfern in London and Belgrave St Ives, but also in elsewhere in the UK, in Ireland and Denmark. 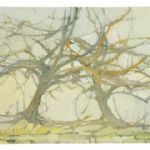 She has contributed to numerous mixed shows, most notably in the last few years with the Arborealists. 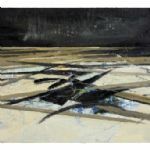 Since her solo show at North House Gallery in 2009, she has contributed paintings to occasional mixed shows here, but this exhibition is an important statement of a major new departure in her work.